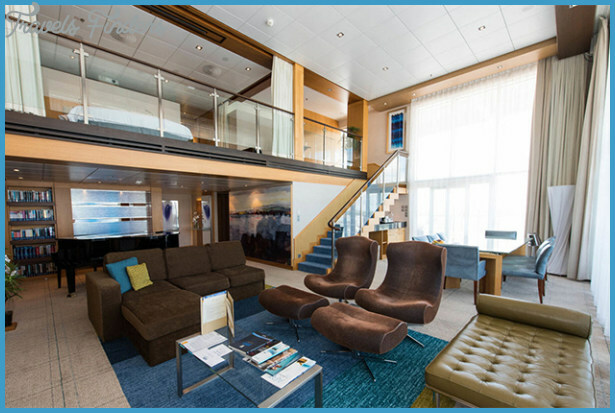 Modern cruise ship staterooms are nothing like the small, cramped staterooms found just a few years ago. 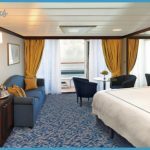 While cabins typically vary in size according to price, most contemporary cruise ships have staterooms that hover around the 150- to 180-square-foot mark and increase in size from there. 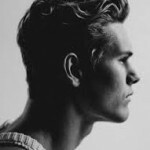 Suites, obviously, offer the most personal space, but also come with the highest cost. These can contain marbled bathrooms, private dining areas, and even your very own baby grand piano not to mention butler service, private elevators, you name it. For most of us, though, a standard stateroom will be our likely home. 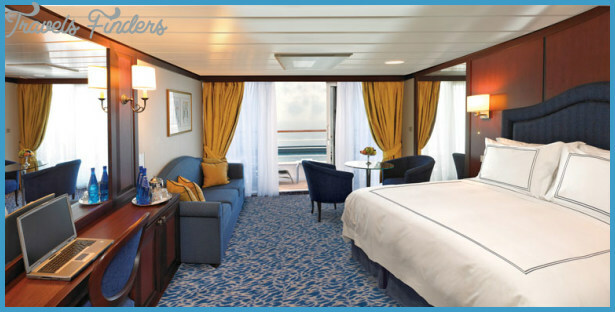 Most cabins on cruise ships today have queen-sized beds that can separate into two twins upon request. Some staterooms may have either a queen bed that won’t be convertible into two twins, or in rare instances two twin beds that cannot convert into a queen bed. Either way, these restrictions will be listed on the deck plan for your cruise ship, as will staterooms that are suitable for third or fourth occupancy. Although they’re becoming increasingly rare, some staterooms notably Carnival Cruise Line’s Category 1A Interior staterooms have bunk beds, which are typically referred to as upper and lower berths. While it seems like a downside, these staterooms can be convenient for friends travelling together, or as an add-on stateroom for extended families travelling together. 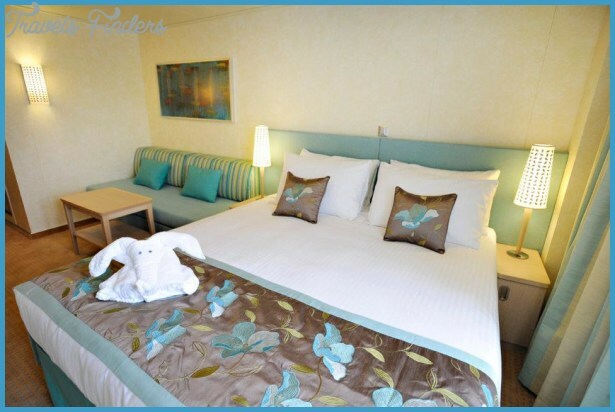 Speaking of which, many cruise lines have special cabins designed for families, with regular twin beds that can be pushed together to create a double bed, plus fold-down bunks. Families may also be able to book connecting cabins (although they’ll have to pay for two cabins to do so). Disney Cruise Line takes things one step further, creating segmented bathrooms that feature individual compartments for showering and washing up, allowing up to two guests to utilize bathroom spaces at once while still maintaining privacy. Norwegian Cruise Line also wins brownie points for the separated, family-friendly bathrooms found aboard their Jewel Class ships. Larger megaships often have hybrid staterooms that can be a smart pick for those who want to stretch their cruising dollar further. For example, on Royal Caribbean’s Voyager-class ships, like Voyager of the Seas, Promenade Staterooms have bay windows overlooking the ship’s massive horizontal atrium. 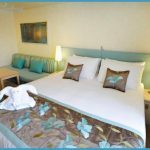 Priced between standard inside staterooms with no view and Oceanview Staterooms with windows looking out on the ocean, these offer a happy-medium for travelers who want the affordability of an inside staterooms but don’t like the idea of not having a window. Specially designated staterooms for travelers with disabilities are ideally located near elevators and other public areas, and feature accessible bathrooms and showers. 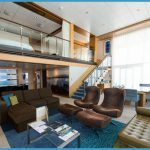 In the past, solo cruisers would have to contend with paying a massive Single Supplement fare but today, many modern cruise ships including select Cunard, Holland America and Norwegian Cruise Line ships, to name a few feature dedicated staterooms designed expressly for the solo cruiser. The vast majority of cruise ship staterooms have TVs, and increasingly these units are interactive, to allow passengers to book meals and activities, as well as see daily schedules. Some cruise lines employ an on-demand service that allows you to watch movies like you would in a hotel. And just like in a hotel, these movies typically carry a hefty fee. A handful of complimentary broadcast-television channels are available (depending on satellite connectivity), along with channels that display a live view from a camera mounted on the ship’s navigation bridge, and a voyage tracker that alternates between the current weather conditions, your ship’s heading and speed, and any relevant voyage information, Some staterooms have amenities such as safes, minifridges, bathrobes, slippers, and hair dryers. A bathtub is considered a luxury on ships and is usually found only in more expensive suites, though Holland America is noted for having bathtubs in nearly all of its staterooms on most of the fleet. The typical ship has several types of cabins, each of which is listed on the deck plans for each cruise ship. The cabins are usually described by price (highest to lowest), category (suite, deluxe, superior, standard, economy, and other types), and furniture configuration (sitting area with two lower beds). The cabins will also be described as being inside or outside, balcony or suite. Simply put, inside cabins do not have windows (or even portholes), and outside cabins do. However, views from some outside cabins may be obstructed usually by a lifeboat or look out onto a public area; an experienced travel agent should be able to advise you on which cabin to choose, and most cruise lines will list major obstructions on their deck plans and categorize these staterooms as such.